No more waiting for weekly scans. Now you decide when your website is scanned! Monsido users will now have access to our new “On-Demand Scan” feature. Up until now, Monsido has been scanning domains weekly. We realize this doesn’t suit everyone’s needs, so we made it possible to also scan the website whenever you want. Depending on the plan you have with Monsido, you will receive a certain number of on-demand scans per month. Does this mean that the weekly scans are gone? 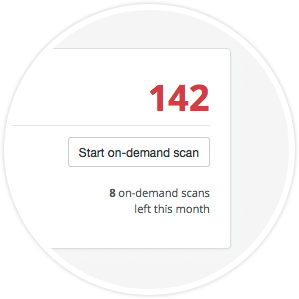 If you start an on-demand scan immediately before a scheduled scan (and the on-demand scan is not completed before the scheduled scan is set to run), then the scheduled scan will not run. Your data is only updated when the entire scan is complete. While your scan is in progress, you will see data from the old scan. These two issues probably haven't affected you before because the scheduled scans are set to run at night. We hope that the new On-Demand Scan feature will allow you to integrate Monsido even more into your daily workflow and make the most of the tool. Have any other suggestions on how we can make Monsido better? We’d love to hear from you! Feel free to contact us directly or via email.